Most of us agree we would do anything for our families. Of course, that’s easy to say when you’re relaxing in your living room reading The Muffin. But what if the anything-your-family-needed was for you to trudge into an unmapped forest full of illness, wild animals and even wilder humans. Would you do it? Could you do it? Martha Conway’s historical novel Thieving Forest addresses the question of how far we would go for our family. When a band of Potawatomi Indians kidnaps her four older sisters from their cabin in June 1806 at the edge of Ohio’s Great Black Swamp, seventeen year old Susanna Quiner is the only left to rescue them. Thieving Forest is the story of her quest to find her sisters, and the parallel story of her sisters' new lives. All five sisters change so much in the five months that they are almost unrecognizable from the young women who argued over petty things on the morning of the kidnapping. Thieving Forest follows five pioneer women and one man as they contend with starvation, slavery, betrayal, and love. It paints a startling new picture of life in frontier Ohio with its mix of European and Native American communities, along with compelling descriptions of their daily lives. Fast-paced, richly detailed, with a panoramic view of cultures and people, this is a story of a bygone era sure to enthrall and delight. Thieving Forest is available as a print and e-book at Amazon, Barnes & Noble, iTunes, and IndieBound. To win a copy of Thieving Forest, please enter using the Rafflecopter form at the bottom of this post. The giveaway contest closes this Friday, October 17 at 12:00 AM EST. We will announce the winner the same day in the Rafflecopter widget. Good luck! WOW: Thieving Forest takes place in the early 1800s in Ohio, the rough and tumble frontier of the time. What made you select this time and place for your novel? Martha: I come from Ohio (Cleveland), but when I was beginning to think about this novel, I did not picture it in Ohio. I knew I wanted it to be a kind of quest novel, and I knew that I wanted my protagonist to get lost in some wilderness, and so I was originally thinking she might be going to Oregon. However, in my very early days of research, I stumbled upon a book called “Tales of the Great Black Swamp,” about this area in northwest Ohio I had never heard of—and, as I say, I grew up in Ohio! So I was intrigued. And this swamp was so vast and so uninhabitable I thought it would be the perfect place for a character to get lost in. WOW: How much did you know about Ohio in the 1800s before you began researching for your novel? Martha: I thought I knew a lot about Ohio, but it turns out I did not know all that much! Of course, I was mostly drawing on my old 6th Grade Ohio state history class and some movies. The different tribes that lived in Ohio in 1806 and their history were all new to me. And the ways the different communities (white and native) adapted to and for each other as they lived side by side was quite revelatory. WOW: Can you tell us a little about the process of researching for a historical novel? Martha: I spent about six months doing research before I began the novel, and then I did a lot of research while I wrote. I changed the novel significantly after the first or second draft—I thought it might take place during the War of 1812, to add conflict, but that didn’t pan out—and so I had to rewrite it significantly and do more research around my rewrites. Turns out I was not interested in the political landscape, but rather in the social landscape and how people really lived day to day. WOW: Do you enjoy doing research? What is the most difficult thing about it? Martha: I love doing research. The most difficult thing is finding good sources. The internet is wonderful for some things (like what a nineteenth century chamber pot might look like—I check out EBay a lot), but for real facts I still take out books from the library. So I would say the most difficult thing is knowing what or who to rely on for basic information. I’ve written things that are contradicted by other sources (how a Potawatomi woman might dress, for instance), and then I have to check multiple times to figure out what is actually right. Another difficult thing was researching the Great Black Swamp. It’s mostly drained now, and although there are some wonderful state parks left (which I’ve hiked along), the paths are nicely maintained and the trees clipped for the benefit of visitors. It’s nothing like what my protagonist, Susanna, would have experienced. It’s hard to be completely accurate with historical fiction, since it is after all history! But you also have more room to imagine. WOW: Can you tell us a little about the journey from manuscript to book for Thieving Forest? Did you work with an agent? Martha: I did work with an agent, Lisa Bankoff at ICM. She’s wonderful. But before I got in touch with her, however, I spent a long time workshopping the novel with my writing group. I think I worked on the novel for over six years before I approached Lisa, so it was in pretty good shape. She had a few comments and I probably worked on it with her another two or three months. So all in all it was a long process. WOW: Did you learn anything writing 12 Bliss Street, a contemporary crime novel, that you incorporated into writing Thieving Forest? Martha: Writing a mystery should be, in my opinion, a mandatory part of every writer’s training! Mysteries really get to the essence of how a plot builds, and how all the moving parts have to work together. WOW: Tell us your top three writing tips. 1. Make writing a habit. Doesn’t matter if it’s every day or certain days, but make a schedule and stick to it. 2. Find a group (or even one reader) that you trust, and regularly meet to discuss your work. 3. Take chances. You can always delete. Martha: My current work-in-progress is called The Floating Theatre. It’s also set in Ohio, but this time in the Ohio River valley in 1840—antebellum America. My main character is a costume designer on a ramshackle riverboat theatre going down the Ohio River, the natural separation between North and South, and she gets caught up in the Underground Railroad. What is a Quest Novel? Stop by for author Martha Conway's thoughts on this exciting genre. Big families...what is that they share, what makes them unique? 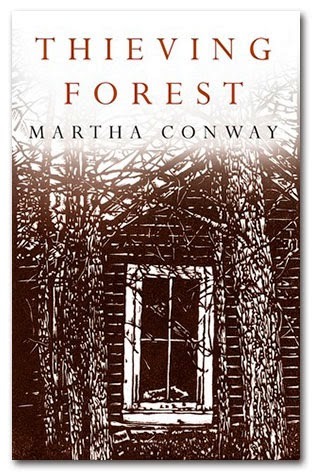 Learn more about family from Martha Conway and enter to win her novel Thieving Forest. When you're caught up in the magical world of a book do you ever wonder what DIDN'T make it into the final draft? 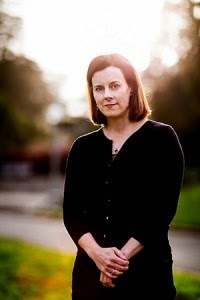 Martha Conway, author of Thieving Forest, tells about the painful decisions that have to be made. Learn more about author Martha Conway in today's interview. The Headless Horseman isn't the only scary thing in the forest this Halloween. Read a review of Thieving Forest and find out what else lurks there. Win a copy of Thieving Forest, the story of seventeen year old Susanna trying to save her sisters in frontier America, and learn from author Martha Conway what was truth and what was fiction. Author Martha Conway shares "What Independent Publishing Means to Literary Authors" as well as a last chance to win her latest book, the historical novel Thieving Forest. Enter to win a copy of Thieving Forest! Just fill out the Rafflecopter form below. We will announce the winner in the Rafflecopter widget this Friday, October 17. Your book sounds fascinating... can't wait to read it. Great interview, Jodi and Martha!